Clubhouse with changing rooms, bar, restaurant, lounge, swimming pool, sauna and pro shop. 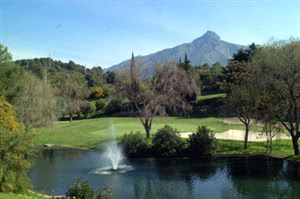 Golf facilities include a putting green and chipping area. Aloha is recognized as one of the best golf courses on the coast. It's a tight course, the fairways are surrounded with both water and trees, which can be quite challenging. All the par 3 holes are very long, 180 mts plus. And it is not easy to score. It has been mentioned that the second hole should be one of the hundred best golf holes in the world. The maintenance of the course is very high,resulting in a excellent condition all through the year. The only thing you can complain about is that the bunkers could be better looked after - they are not raked often enough so they can be very hard. The club house have just gone through a big renovation, creating an impressive entrance with a new pro shop. There is a good restaurant with a large terrace which has amazing views. If you play with a member the green fee comes down to a more reasonable level, about 70€ and you also get a more favourable time slot. This course is definately worth a visit. Of course as a long time member i may be bias!!! !